Large rooms, very close to supermarkets and the beach area, free parking available on site, extremely good dinner (way beyond our expectations). The staff at the reception/restaurant area are extremely nice. Absolutely fantastic location, just a walk away from the main strip, although the property itself is peaceful. Very large, clean comfortable rooms, with really friendly staff. Best personnel I’ve ever found in a hotel, from the reception to the bar to the room maidens, everyone was always smiling and ready to help. Nice pool, big and comfortable rooms, well positioned to the main bar street. It might not be a fancy place but I’d sure stay there if I’d need to go back to Ayia Napa. The two which firstly come to mind as positive about the hotel are the nice and helpful personnel and the general cleanliness of the place- rooms were cleaned everyday, as well as towels were changed so. As for breakfasts - variety of courses which would make it possible for almost every guest to choose their favorite. Another which we liked (and which struck us positively compared with other 3 star hotels) was the convenient 'after-check-out' infrastructure- luggage room with a scale where you could weigh your baggage, changing rooms and even showers (as for the latter two we were told about however we had not seen personally). Very nice appartment, confortable and large bed, clean room. The food was excelent, and we couldn't be happier that we chose the breakfast and dinner option. They have a large variety of food, and each day is a different cuisine (international, greek, italian, roast night and so on). It is quiet because it is not in front of the main street, so you will defenetly get the rest you want. We had a lovely time. The breakfast and dinner was very good.The swimming pool was gread and the location was in the centre. The staff was very friendly, everything was excellent- big apartment, nice location close to the center, very good food, clean location, towels changed every day..good place to stay for families. Highly recommended. 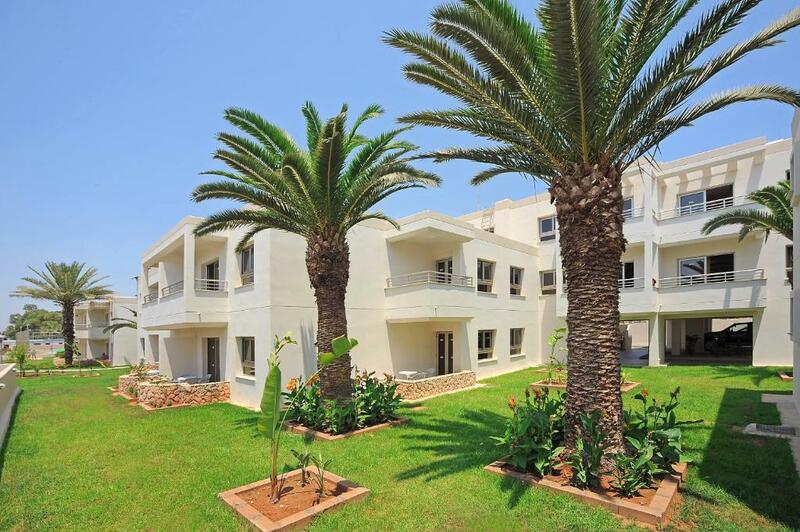 Lock in a great price for Euronapa Hotel Apartments – rated 8.3 by recent guests! 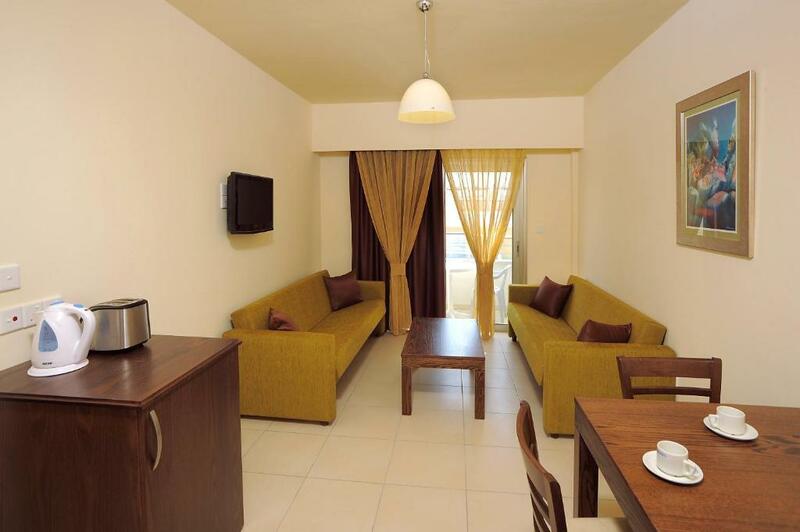 Euronapa Hotel Apartments This rating is a reflection of how the property compares to the industry standard when it comes to price, facilities and services available. It's based on a self-evaluation by the property. Use this rating to help choose your stay! 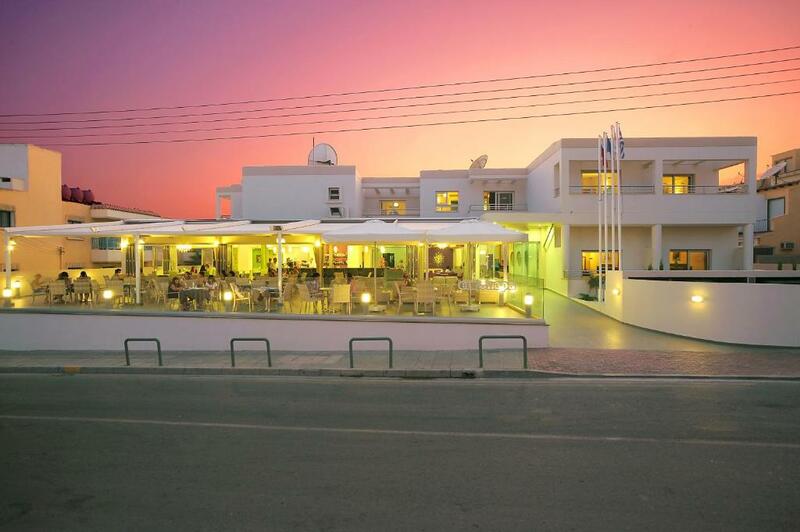 Euronapa Hotel is conveniently positioned only 1,650 feet from Sandy Bay Beach and 1,000 feet from the lively center of Ayia Napa. It has an outdoor swimming pool and sauna. 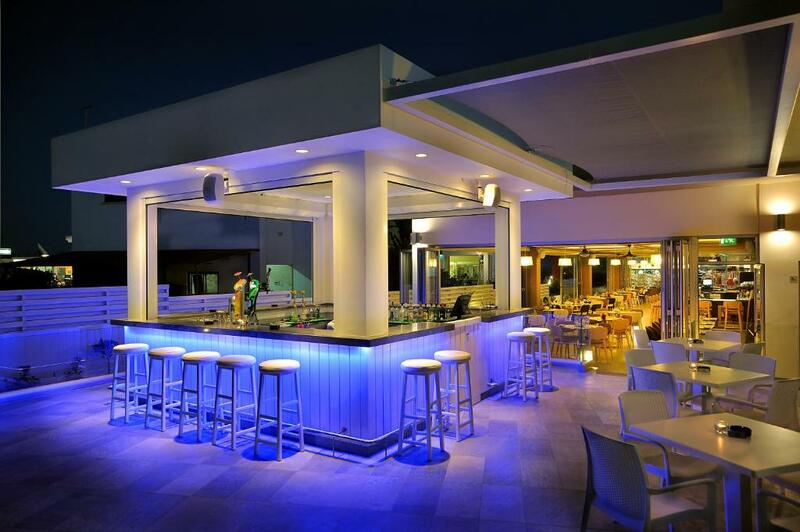 The Euronapa Hotel Apartments features a poolside snack bar and a lounge bar with satellite TV. Guests may relax in the hotel’s palm garden or sunbathe on the sundeck surrounding the pool. There is also a designated shallow pool for children. All apartments have a kitchenette and a cozy seating and dining area. 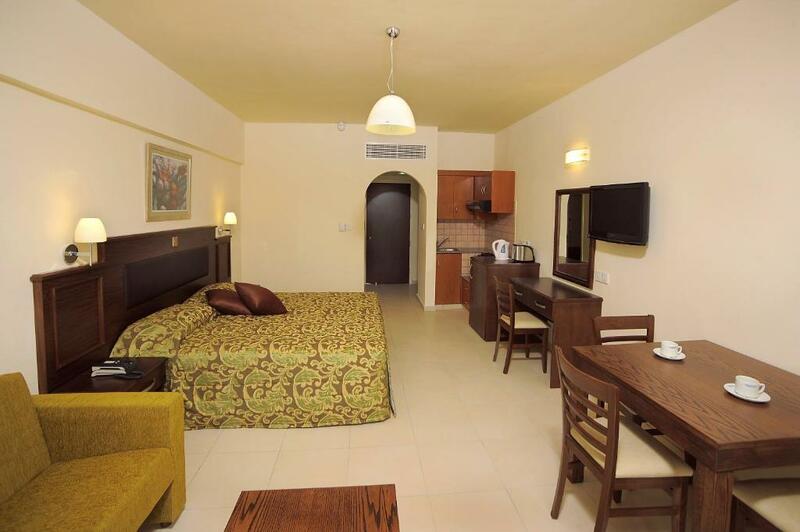 Air conditioning, safety box and fridge are also available in the rooms free of charge. Guests at the Euronapa can make use of many recreational facilities, including a multipurpose sports court and a pool table. The popular Nissi and Limanaki Beaches are a 15-minute walk away. Within 350 feet you will find shops, bars, cafes and restaurants. Larnaka Airport is 34 mi from the hotel. 뀐 Located in the top-rated area in Ayia Napa, this property has an excellent location score of 8.3! When would you like to stay at Euronapa Hotel Apartments? Featuring a stylish modern design, these studios come with a living room, a private bathroom, hairdryer, LCD TV with satellite and music channels, direct dial telephone, kitchenette area, with oven with cooking rings, kettle, toaster and balcony or terrace. Featuring a separate living room, this stylish, modernly decorated apartment features a private bathroom, hairdryer, 2 LCD TVs with satellite and music channels, direct dial telephone, kitchenette area, oven with cooking rings, kettle, toaster and balcony or terrace. House Rules Euronapa Hotel Apartments takes special requests – add in the next step! Euronapa Hotel Apartments accepts these cards and reserves the right to temporarily hold an amount prior to arrival. Please inform the hotel in advance in case any children will be accommodated, as extra beds are subject to availability. Guests are kindly requested to provide the total/remaining amount upon arrival. Everybody speaks Russian but none of the cleaning team understands English (which is hilarious for me). We were disturbed for several times (even if the DND sign was on the door) and if we did not allowed the access (sometimes it was impossible as our baby was sleeping) there was no cleaning performed on that day. Lots of ants on the premises, the fridge was not very clean and the owen was very old and rusted. The only fault was the wait for food and drinks. Hmm...We remained unsure whether that could have been a cause of us getting sick at the end of the stay yet it is possible it might have been caused by not necessarily well maintained air con. The other thing which could be improved- the helping personnel in the dining room sometimes too quickly (and without making sure if they can) sweeping away your plates etc. The tvs are small and the variety of channels is not that great, but we didn't go there to watch tv. The furniture is a bit outdated, but in good condition. Sound isolation not so good, wifi was not very good in our room. Big room, we used the safe box which was for free, room was cleaned every day, wide breakfast choice, dinner was also ok. Very nice hotel for those who prefer sleep in quite place but have quick access to all types of entertainment (sea, bars, clubs, nice street to walk and to eat). Comfort clean rooms, very nice swimming pool, great outdoor area for kids with a lot of fun stuff. So highly recommended for all types of travelers. Difficult to find parking place. The was a bad smell in the kitchen. The toilet was not very clean. The noise made by ATVs (at 5 AM). The sheets were the same the whole vacation (1 week). No coffee machine in the room, the waterproof mattress cover was uncomfortable for me but fine for my partner.